Baader Planetarium's new 1.25" 2.25x Barlow allows you to use the Baader Hyperion Zoom Eyepiece as a super-zoom 3.5 - 10.5mm eyepiece. But even though it has been optimized for use with the zoom, it is an outstanding general purpose barlow that can be used with any 1.25" eyepiece. (1) Main Optical Body - which consists of the exposed barlow lens elements in a 1.25" barrel. This is to be used with either Adapter A or B below. (2) 1.25" Adapter A - which screws onto the main body on one side, and to the Hyperion Zoom or any other eyepiece with standard 1.25" filter threads on the other side. (3) T / T-2 Adapter B - which screws onto the main body on one side and presents a standard male T thread on the other side for direct attachment to cameras via a T ring (not included). This allows you to use the barlow as a 2.25x photo projection lens. 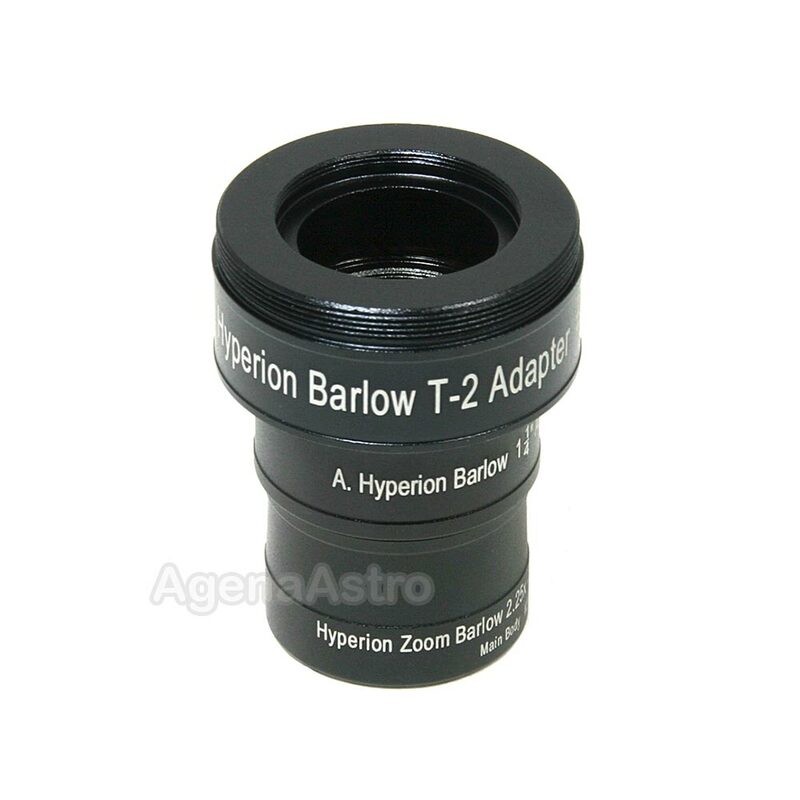 You can attach any T2-1.25" eyepiece adapter to the Barlow+Adapter B combination and use the setup as a conventional barlow. This will allow you to easily swap 1.25" eyepieces in and out, instead of screwing the barlow into one eyepiece at a time. Lightweight,Quality Lenses,Easy to Use. Must have. Review by Matt of Melbourne, Victoria Australia. Top product again from Baader. If you want flexibility, high quality and dependable results from a Barlow then look no further. Very minor light loss compared to other Barlows. This is the 4th Barlow brand I have tried and it is the only one I have kept after 12 month of use. Highly recommended item and highly recommend brand. Thank you to Agena for your fine service and top quality products. This barlow doubles your zoom for high power use. I also use it with my 80mm refractor for terrestrial viewing. Review by Astronewb of Canton, CT. This barlow addition for the Baader 8-24 Zoom is an excellent addition. Plus, it will thread onto any other 1.25 eyepiece with a threaded nosepiece, increasing it's utility. If you can't find a combination of barlow/eyepiece with this, then you're doing something wrong. Review by astrogeekwannabe of Marengo, IL. This is the best investment I have made. Owning a SN8 f4 there is coma and astigmatism as with most scopes. This will correct it. Used with baader zoom awesome. In fact took out my cheap old eyepieces and amazingly corrected those to where the only difference between the zoom and old eyepieces were the field of view. When the baader 2.25x barlow was removed the views were distracting. Replacing the barlow made me feel like I was looking through an expensive scope. Yes I have looked through expensive scopes at length. Just don't have a bottomless pocket book for this hobby. Would I recommend this product to anyone? Yes, everyone interested in a well corrected barlow. I have the baader t2 connectors which made opportunities endless. I can't believe the views that can be obtained. Perfect stars all the way to the edge, no more seagulls and spikes blasting from stars (astigmatism), Jupiter was clearer than I have seen it, star clusters amazing, just perfect stars so pretty. All eyepieces. Don't hesitate.